Ship directly from your distribution center, helping reduce transit times and transportation expenses. Maintain greater control of transportation costs by using your existing FedEx Express account. Merchants no longer have to ship items to a FedEx Cross Border facility first. With Merchant Control, FedEx Cross Border prepares the necessary international documentation and provides it to the merchant so they can ship directly to their international customer from their own distribution centers. Merchants and customers can enjoy reduced transportation costs and transit times by eliminating the domestic shipment leg. Merchants have the flexibility to fulfill orders directly from multiple distribution centers, or split the order and fulfill individual items associated with an order from multiple distribution centers. Please email us at fcbsales@ftn.fedex.com and an account specialist will contact you. Software development kits make setup simple. Customers stay in the merchant's web environment. Load times for the checkout page are not impacted because customers are not re-directed to a third party page. Security measures provide payment fraud protection and help get orders accepted. Return capabilities can make returns easier for both merchants and customers. Multiple language options and 80-plus currency options help provide a more localized shopping experience. Shoppers can choose from multiple global payment options such as credit cards, debit cards and online wallets. Multiple transit options let shoppers choose the speed and rate combination that works best for them. FedEx Merchant Control enables the fulfillment of orders from your domestic distribution center directly to your international customers. First, FedEx Cross Border implements our technology for cross border transactions and classifies your product catalog for all items that are able to be sold internationally. Your global customers are then able to browse your website and feel comfortable purchasing, due to a checkout experience with a more localized feel and transparent cost calculations. 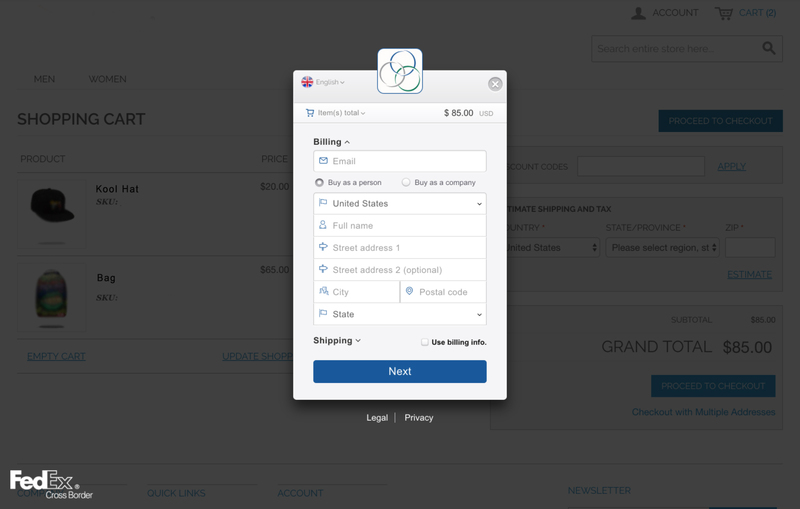 Once a purchase is made we will notify you, via HTTP notification, when your order documentation is ready. After document retrieval, orders can then processed and shipped directly from your domestic distribution center to your international customer. Checkout by FedEx accepts over 80 currencies, includes up to 15 payment options and provides the added security of payment fraud protection. Checkout by FedEx provides a convenient shopping experience for your customers. Their shopping experience can feel more localized, when it occurs in one of nine available languages and in a local currency. FedEx Cross Border also calculates the full landed cost for their order, so there aren't any surprise expenses later. Interested in expanding your business into the international market? Want to open your virtual doors to international shoppers Learn how easy it can be to support global e-commerce with the help of FedEx Cross Border global e-commerce technology.